The Glencoe boys lacrosse team knew the deck was stacked against it. The Crimson Tide, playing at Lake Oswego in the Oregon High School Lacrosse Association state quarterfinals on Friday, were playing in hostile territory, facing a higher-seeded opponent and an opponent with huge goals of its own on the line. In the end, the Lakers raced out to a 9-0 edge, held Glencoe scoreless for the game's first 34 minutes, 35 seconds and pulled away to win 13-4 at Lake Oswego High School. "It's tough when you don't get (an early) goal and you don't have the confidence," said Glencoe senior Drew Messmer. "They are a unit, they pass, they've got dodgers, they've got big-time players and they play as a unit." "They're very competitive," added Glencoe senior Ruben Gallardo. "They brought something that we've never seen before, something we should have been more prepared for." With the loss, the sixth-seeded Tide finished its 2018 season with a 17-4 overall record after winning the Pacific League. Third-seeded Lake Oswego, meanwhile, improved to 14-4 after winning the Three Rivers League. The Lakers advance to face defending state champion Oregon Episcopal School in the state semifinals at 6 p.m. Wednesday at Newberg High School. "It started with our work in practice — we've been putting in a lot, a lot — and we just came out strong," said Lake Oswego sophomore attack Jonas Hunter, who led all scorers with four goals and also added an assist. "We've been preparing for their zone and man (defenses) and just executed." "We prepared really well. We knew what they were going to do," added Laker junior goalie George O'Brien, who finished with eight saves. "We didn't worry about what was going on outside of the lines and we just came out ready. We came prepared, we came out confident and we played well." Four different Lakers scored in the opening quarter, with Hunter breaking through 1:54 into the contest, followed by scores from Marshall McGuire, Dylan Baker and Cal Motylewski to take control early. The game slowed in the second period, though, with Lake Oswego managing just one score — a Dominick Sinclair goal from the left side with 9:01 remaining in the first half — to lead Glencoe 5-0 at the break. The Lakers tacked on another four unanswered goals in the first 7:31 of the second half to extend their lead to 9-0, the attack led there by scores from McGuire, Hunter, Sinclair and Hunter again. Glencoe finally got on the scoreboard with 1:25 remaining in the third quarter when Erik Cortez connected from 10 yards out past O'Brien to make it 9-1 at the end of the period. In the fourth quarter, Hunter and Glencoe's Dylan Brauer traded goals in the first 2:41 of the period, but the Lakers answered with back-to-back scores from Baker and Michael Shakerin to push their lead to 12-2 with 6:24 remaining to play. Glencoe finished with a 2-1 scoring edge in the final 5:52, both of those goals by Nathan Rosales while the Lakers' final score came from Baker on a McGuire assist. Despite the loss, the Tide's players reveled in their solid season and the progress their program had made. "There's no regrets," Gallardo said. "We were playing as a family, we were playing as a unit. There's nothing I would take back." "I think (I'll remember) how much fun I had playing with my team, the whole experience," Messmer said. "Practice was fun. We just joked around, and even when we were down, we were still lifting each other up. We didn't get on each other." For their part, the Lakers were thrilled with how they played and excited for what lies ahead. "It's a massive deal. We haven't been to the semis in over 10 years. It's special," Hunter said. "We've just got to work hard every day in practice." "As a team this year, we just really love each other. Everyone on the team is pretty much just united as one," O'Brien added. "We work hard and we're unselfish. We've just got to prepare well (for the semifinal), have a good week of practice and we'll play Laker lacrosse." In addition to Hunter's four goals, Baker had three, and Sinclair and Motylewski two each. 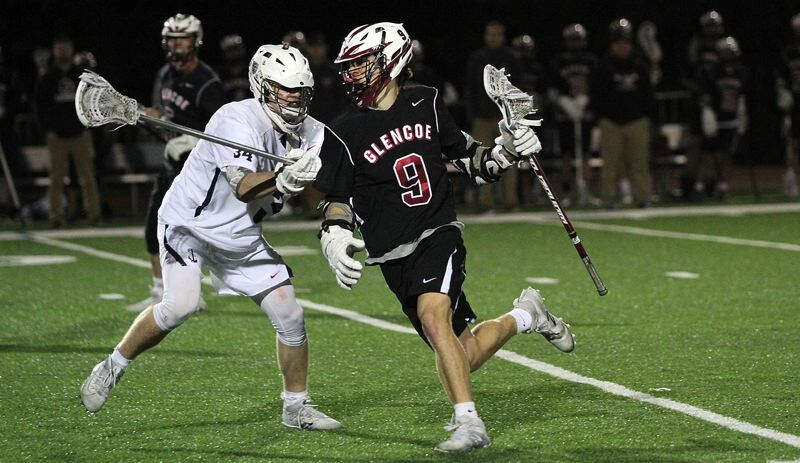 In team stats, the Lakers had 39 ground balls to Glencoe's 18, Lake Oswego outshot the Tide 45-24 and carried a 16-4 edge in faceoffs.